Post break-up with singer Ariana, Pete Davidson releases heartbreaking statement on Instagram about bullying and mental health. After going on and off from Instagram, The “Saturday Night Live” star, 25, makes return to Instagram posting a powerful yet emotional statement that the actor is been going through since his split from Ariana Grande. After Ariana broke-up with her four month engaged BF Pete Davidson, The SNL star has had a pretty tough year to deal with the heart break and getting dumped by Thank U, Next singer. As Ariana is healing herself with her music release as a tribute for the loss of her ex boyfriends Mac Miller whom she dated before Pete for two years, Pete Davidson is the one who is suffering bullying and bad words on social media after Ariana dumped her. 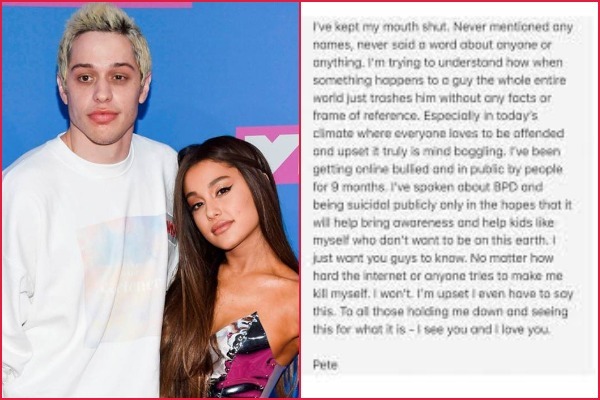 On Monday Pete, 25, returned back to his Instagram account and shared a heartfelt statement about bullying and mental health, just after months of highly publicised split with fiancee Ariana Grande. He asked in his post why why the “the whole entire world” was trashing him. The Saturday Night Live comedian and singer Ariana headed for a break-up in October post Mac Miller’s death. Pete opened up to Variety about his struggle with borderline personality disorder after his father passed away in the 9/11 attacks and it’s consequences almost caught him into suicidal things. In fact Ariana have always been vocal about her split and accepted that it was she who broke up with him, so we don;t understand why Pete is trolled online!